Looking for answers about gluten-free foods? About the gluten-free diet? 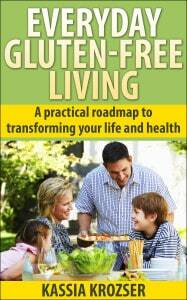 About living gluten free? Here are answers to some common questions! Yes, rice is gluten free. All kinds of rice — white, brown, forbidden, arborio, jasmine, and others — are safe to consume by those following a gluten-free diet. While you may encounter “glutinous” rice, be assured it does not have gluten (note the different spelling). Glutinous rice, also known as sticky or sweet rice, is commonly used in Asian cooking, and is perfectly safe to consume on a gluten-free diet. Yes, with some caveats. For more details, read this longer post. Is Spaghetti Squash Gluten Free? Oh yes, it certainly is (as are all vegetables)! Not only is spaghetti squash gluten-free, but it’s also low carb. I love the stuff, and use it all sorts of ways, including as a low-carb pizza crust, and, of course, as a pasta substitute. If you prep the squash ahead of time (like during your weekend meal prep session), you can have dinner on the table in minutes! This is a subject near and dear to my heart, so I am happy to say that wine is, indeed gluten free. You will sometimes encounter someone who says otherwise, citing the notion that wine barrels are sealed with wheat paste. This is an incredibly rare occurrence, and, generally, only happens with some European wines. Most wines are tank fermented, particularly in the United States. For more details, see this article from Gluten Free and More. Most commercial beers are not gluten free. Beer is most commonly made with malted barley (which is the sweet note in most beers). Some beers are made with wheat. Barley and wheat, along with rye, are the unholy three of the gluten-free world. There are gluten-free beers out on the market, and, while I haven’t had beer in decades, I am told they are…okay. I imagine the quality of gluten-free beer will improve over time. Yes, most ciders are gluten free (always check ingredients!). And we are living in lucky times because ciders — which range from sweet to tangy, and are generally delicious — are widespread and available just about everywhere.